The station is a two-room, one-story, street-level wooden structure with green and red paint. Formerly the station served as the ticket office for the commuter train stop (offered until June 30th 1966) and freight depot building. The current structure has been located on this corner since 1894 when it replaced the orignal station that had burned one year prior. 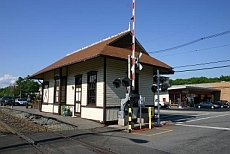 Hawthorne station is leased by the VRA aka Volunteer Railroaders Association from the NYS&W RR aka New York, Susquehanna & Western Railway, the station's present owner. 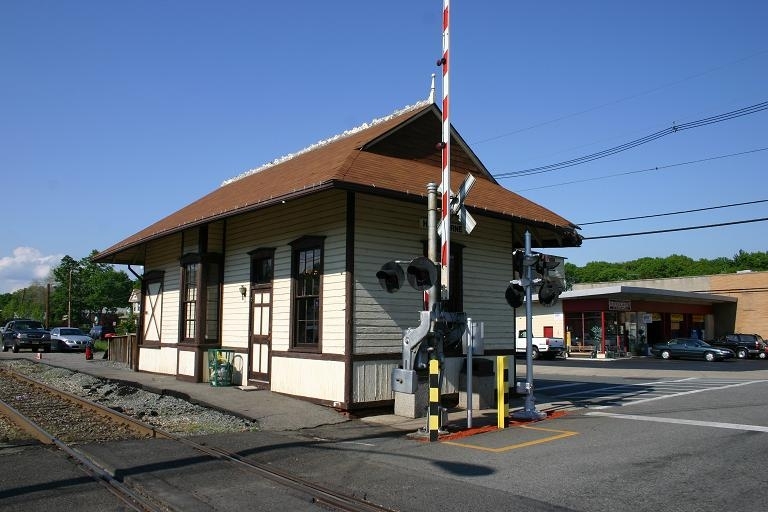 The VRA uses the station as a ticket office for their fund raising Easter Bunny train rides and Santa Train Ride in NJ for the benefit the future NJ State Transportation Museum. 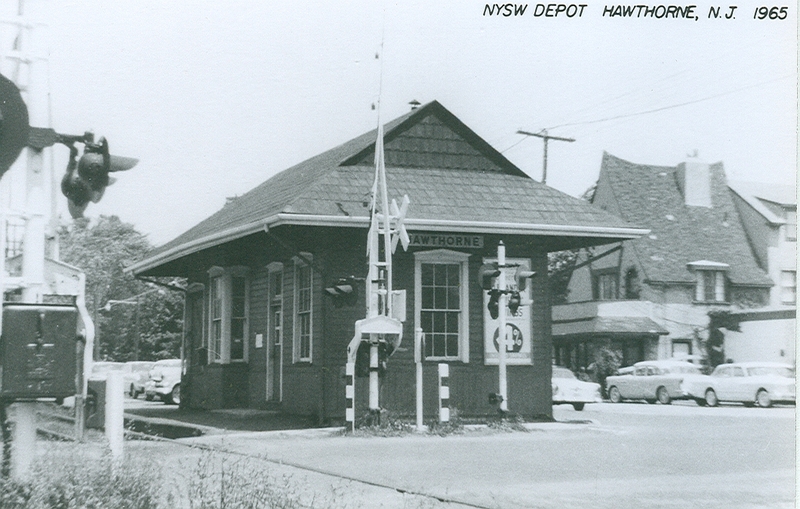 Hawthorne NYS&W station - Click to enlarge. Well it is done, the station is sitting on her new foundation and after a little work to fine tune where she sits, she was taken off the rollers that carried her and came to rest on the foundation. This work took place on Monday September 20th 2010. More on how it got there! The New Jersey Western Railway aka NJW RR started building the rail line westward from Patterson, reaching Hawthorne in 1869. In 1869 the NJW RR extend the line ten miles from Hawthorne, reaching Bloomingdale in 1870. The New Jersey Midland Railway subse­quently merged with the NJW RR in 1880.1 In 1881, thru a merger the New Jersey Midland Railway and several other nearby railroads became the New York, Susquehanna & Western Railroad Company. The Delaware Otsego Corporation on September 1st 1980 took control of the NYS&W Railroad, renaming it the New York, Susquehanna and Western Railway. Hawthorne was originally was a part of Manchester Township, which dated back to the Revolutionary War. Paterson businessmen complained in the early 1800s about traveling to the county seat in Hackensack. 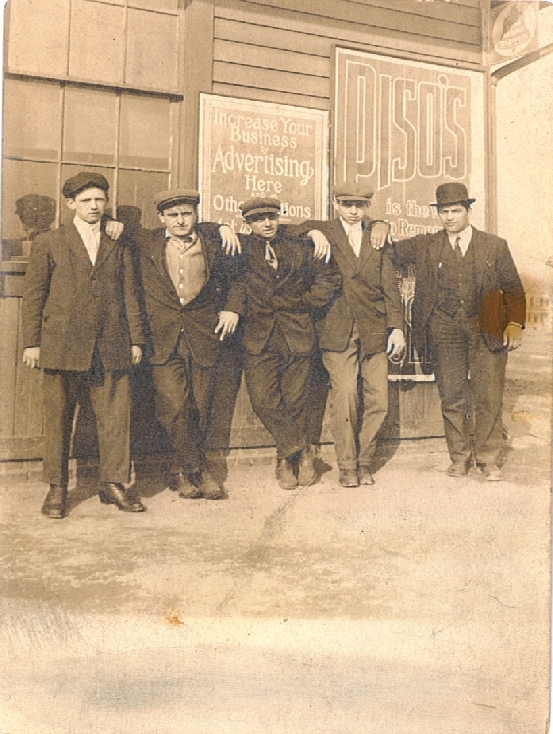 Passaic County was formed in 1837 to quiet them, taking Manchester with it. As time went on, Manchester township broke up into several towns and boroughs. 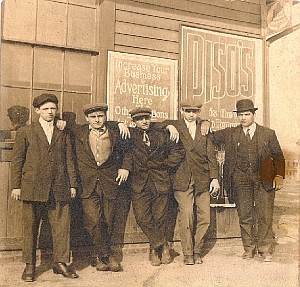 Hawthorne became its own borough on March 24th, 1898. Hawthorne station in 2010 prior to move and restoration. Click to enlarge. The VRA has repaired the roof, done some other repairs, taken out the back door and rebuilt the west end of the building. In the future a plan is to include the coal bin that used to be there. Much cosmetic work and painting has been done to the building as well. This all sounds very adventurous and in many ways it is, but the VRA has the backing of the town and a great bunch of people both in the VRA and local citezens who want to see this all through. The VRA is looking to get donations and grants as well as local, state and maybe Federal funding. The VRA has wanted to do this for many years and a few things have made the VRA go after this all again. Lou DiGeronimo many years ago had tried to save the building and use the station as his archi­tectural office. The railroad would not let him do that at the time. As a VRA member Lou has made it a personal goal to see to it that the work gets done. He first saw us at the New Jersey Central Terminal Festival and he immediately said he wanted to get involved with the VRA and help save this building. 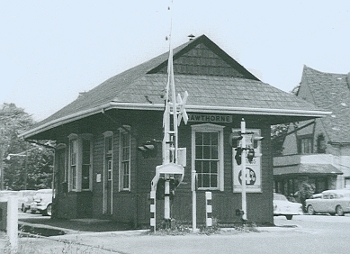 Hawthorne station in 1965. Click to enlarge. 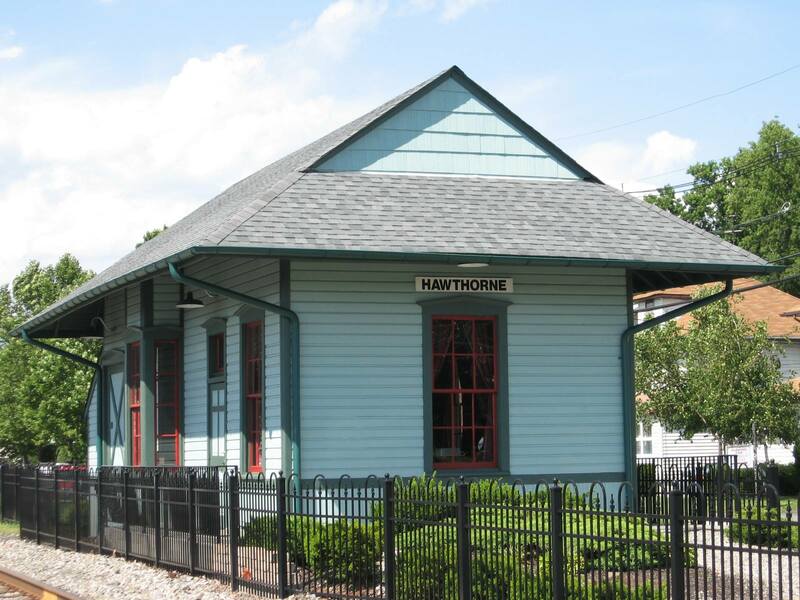 Then the Boro of Hawthorne has decided they want to do a downtown rehabilitation project that would have a railroad theme complete with railroad style lamps and benches. As part of that plan they would like to see the building moved off the corner to protect the building and increase visibility at the corner. A small park like area is to be built where the building once stood. This by the way is the same idea the VRA came up with a few years ago and was adapted from the VRA's plan. For you G scale railroad modelers, part of the idea is to include an operating layout to be run on special occasions. The VRA needs your help! With all these things pointing in the same direction it is time to make it happen. This is going to take lots of work, time, money and effort to make happen and it will not happen without you. We need to get a dedicated group of people together and have them stay together to see that everything that needs to be done will be done. If you would like to help out talk with a VRA board member, e-mail us or drop us a note in the mail and say, "I want to help save the station." 1) The New-Jersey Midland, The New York Times, March 11, 1880.